Power Library offers patrons access to a variety of online databases. Covering a variety of topics from “auto-repair” to “Literature. A great place to search for and learn about books that you may be interested in reading. Practice tests, Skill Building, Career Help, Etc… This site will help you gain confidence in most aspects of your professional life. Use this to trace your family’s genealogy and family history using a variety of different sources. Search full references in the subjects of: Business, Environment, History, Law, Literature, Medicine, Multicultural Studies, Nation & World, Religion, Science, Social Science. You’ll have access to browse through the highlights of the major decades in American History, the solar system, literary works, and more! POWER Library Kids offers children a variety of different electronic resources. 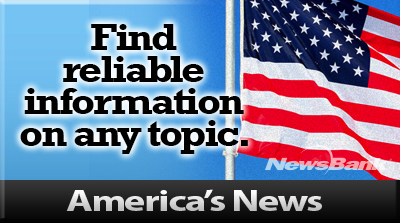 News Bank America’s News: Find information and search topics from over 2800 newspapers from across the country.